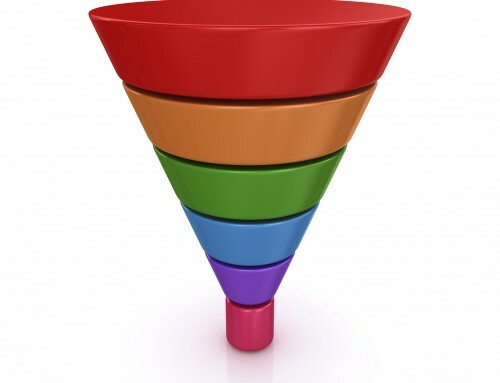 A new phase of your business, a new project, and a brainstorm walk into a bar. Organizing lots of ideas can be overwhelming, unless you get all the ideas onto one canvas, where you can review them all together. Once you can see everything in one place, it becomes much more manageable. Chalkboards have been used to splash ideas for centuries. Scribble on the wall, do your thinking, erase and repeat. Whiteboards are the modern equivalent for brainstorming, for planning, and for short-term lists. You can move your ideas (called ‘nodes’) around each other on the canvas. You can save your MindMaps, to revisit your brainstorms later. If you’ve never used a mindmap on your computer before, try one of these 4 free mind mapping tools. These are all browser-based mindmapping programs, so there is no software to install. The strength with MindMeister is its simplicity. 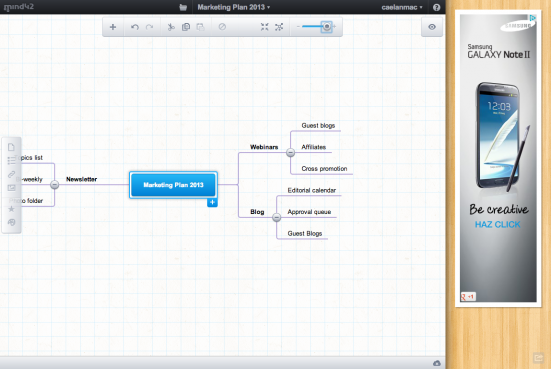 You can export a mindmap to a text outline, pdf, or image. The history function lets you see previous versions of your mindmap, and you can share them with selected collaborators. Upgrading from their free plan gives you the ability to search through your mind maps, edit them offline, and export them to the excellent Freemind application. Techie note: Freemind is not browser-based; you have to install it on a computer with Java. However, it’s .mm extension has become a standard exporting option for every mind mapping tool, so if you get serious about mindmapping, you will become familiar with Freemind. This is a graphically friendly tool, but it suffers from a common plague of other mindmapping tools – too many features, that aren’t implemented well enough. That said, Wisemapping does have some great ways to modify individual mindmap nodes. You can add icons to any node, to assign priority or stage. This helps to organize your ideas sequentially. You can easily drag an arrow between any two nodes, connecting unconnected ideas. The zoom function is a little clunky, making it difficult to navigate around the mindmap. And the drag-and-drop feature looks graphically fluid, but actually uses a grid, making it challenging to move your ideas to the right place. 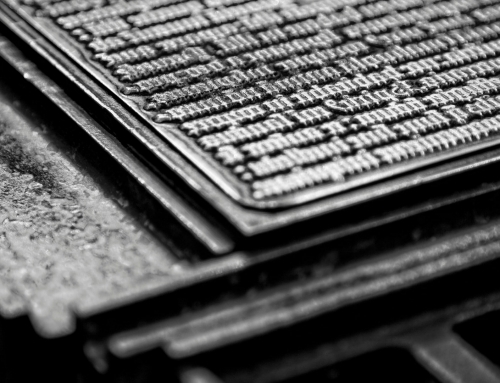 What WiseMapping loses in function, it makes up for in customization. You can change the size and colors of the text, create borders and bubbles around them, and organize your completed mindmap artistically. 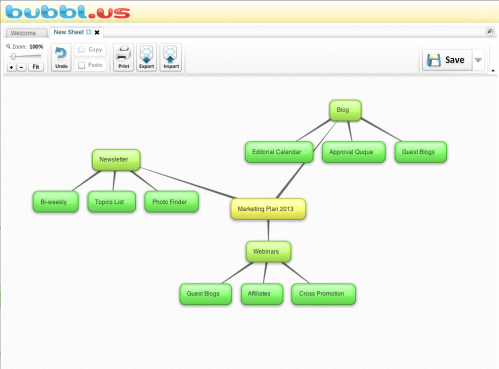 As it’s name implies, Bubbl.us has a friendly, bubble-shaped design for its mindmaps that is pleasant on the eyes. These bubbles are truly drag-and-drop, and you can drag a branch into a different tree seamlessly. You can even keep different mindmaps in different ‘sheets,’ as in Excel. If you are managing multiple mindmaps, saving them in bubbl.us will give you the ability to transfer your ideas from one to another easily. There aren’t a whole wide range of underused features, like icons or links. You can change the text a bit, and the color and shape of the bubble, but that’s it. Strong and simple. You only need to signin to Bubbl.us if you want to save your mindmaps. That made this tool the easiest to get started and try right away. If you want to try making your first mindmap, this is a great place to start. Mind 42 is lacking in design and ease-of-use. However, it has the most innovative features out of all the mindmaps in this list. This grid-based mindmapping tool doesn’t let you drag and drop very easily, but the individual nodes in your MindMap can do a surprisingly wide range of actions. You can attach notes and images to branches and nodes, and link the nodes to websites. When you roll your mouse over a node, you get a preview of the website at the other end of the link – very useful if you’re using multiple websites in your mindmap. You can also attach voice notes to individual nodes, which makes this the best collaboration-based mindmap in this list of mind mapping tools. There’s a good zoom function, so you can quickly get a bird’s-eye-view of your entire canvas. You can also share your mindmaps with the rest of the Mind42 community. 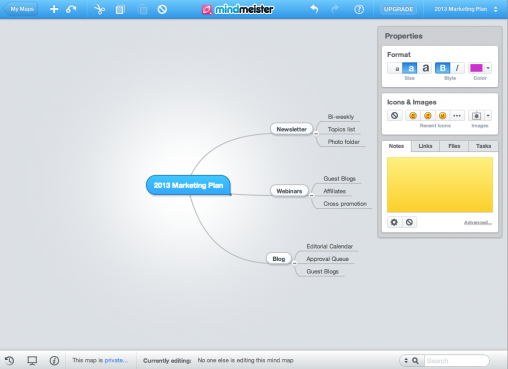 No matter what tool you use, you can upload your mind map to Mappio, and share it with the world. Some of the world’s best mindmaps are housed at Mappio. 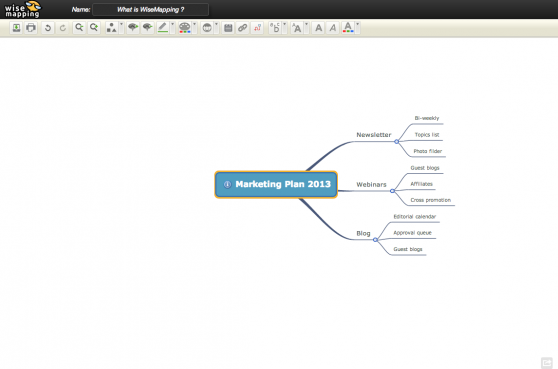 If you’re just getting started in mindmapping, browse through Mappio’s archives. You’ll get some great new ideas on how you can structure your own ideas on a canvas. Caelan is working with me on a large project. He introduced me to Mind Meister, and it is an incredible project management tool. I highly recommend using it and working with Caelan as he is able to understand big ideas and articulate them using this medium so effectively. I really like the collaboration aspect of MindMeister. It’s like Google Docs on a whiteboard!